How To Get ARCs & What Not To Do! Photo stolen from Jenna Does Books! I know practically every blogger out there has gotten this question. I also know a lot of bloggers have already answered this question but just in case, here are my two cents regarding ARC requests. Before I even get to the part about ARC requests, there are some things you should consider before even typing the email. First, how long have you been blogging? If you have been blogging for less than 6 months, I would suggest holding off on sending the request. I know some publishers will send books to newer bloggers but it looks a lot better on you and your blog if you have some experience under your belt first. Second, what kind of audience do you have? If your blog has under 100 followers/subscribers, I would suggest reviewing your own books and working on building up your audience. Truthfully a lot of publishers won’t consider you if you even have under 500. And yes I do say followers but stats also play a big part. Build up the traffic to your blog and that will help too. Finally, do you have time to review whatever book/books you are requesting? Whenever you request a book for review, make sure you are actually going to review it. ARCs are not cheap and you could be taking one from someone who actually has the time to read and review it. Okay, now onto the actual review request part. Some people say I come across as too professional in my review requests (in any email, really) but it’s better to be too professional than not professional enough. Start off by introducing yourself and your blog. Include a link to your blog (obviously.) Give background on your blog such as how long you’ve been running it, how many followers and email subscribers, and how many monthly pageviews you get. Make sure to include total pageviews and unique pageviews as well. I’ve also started to include Twitter followers in my review requests because I do tend to talk a lot about books on Twitter. It’s up to you whether or not you want to include this information. Last but not least, if you post your reviews anywhere else on the internet such as Amazon, Goodreads, B&N, include that as well. Next, request your book/books. Always have a specific book in mind when you send a request. You can certainly request more than one book but keep it reasonable. If you want to, include a reason why you want the book. It’s always nice to have a little personality in your email. Finally, include your mailing address, always! I have no idea how many review requests publishers get in a day but it can’t be a small number. Don’t make the publisher email you back to request your address. It’s a waste of their time. At first I thought it was kind of presumptuous to send my address but I quickly found out that that’s not the case at all. It’s very helpful to the publishers. Also, don’t expect a response always. There are some publishers who will respond to say something like “the books are on their way” but once again, that’s very time consuming and they can’t do it with all requests. Just wait a few weeks and see if the book show up in your mailbox. If not, wait a while, build up your blog a little more and try again. You should also always follow up your review requests. If you get the book for review, email the publisher a link to your review once it goes up on your blog. If you know the specific publicist for the book, email your review to them. If not, you can just send it to the publicity address. It just shows that you actually took the time to review the book and you are much more likely to get books from that publisher in the future. Now, I’m sure you are all wondering where you send your review requests. I have compiled a list of all publicity emails so check them out! If there is an email missing, I may just have forgotten that pub so feel free to shoot me an email or comment below and I will look into it. Also, I want to mention that you should never email an author for a review copy of their book. They get a very limited number of copies of their books and they aren’t meant for review purposes. If you are looking for review books, always email the publishers. Edit: For further reading about ARCs and publishers, check out these posts! Valuable information here. I think it’s really important to review your own books first. I’ve been reviewing on other sites for years but only recently started blogging. I think its important to show publishers that you know what they’re about maybe by mentioning other books that they published that your liked/reviewed. They love loyalty! Great post! I actually have an ARC I’m really wanting to request, and while I do get ARCs sent to me from things like Shelf Awareness, I haven’t very often contacted a publisher to request. So this will be some very helpful info for me! Best post I’ve read on the publishing/blogging industry in a long time. Well done! Hey thanks for the post. I am new to this and it is valuable advice. I would add that if you have been reviewing on Amazon – then that should be part of both your Blogger profile and your blurb on the email you sent the publisher. I love it when “seasoned” bloggers provide posts like this (I previously provided one of my own, too) because some people probably would not believe how often we are asked about all the how’s, when’s, who’s and what’s to consider when it comes to ARCs. Most of all, people need to remember that ARCs are a privilege and not a right. Very informative post. Thanks for the information. One thing I would say is I think if you build a reputation with online E-ARC companies like Netgalley and Edelweiss, it will help a out a great deal. 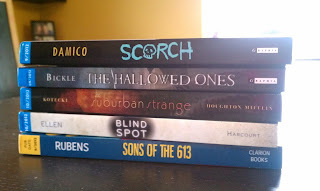 I only have 160 followers, but have been blogging since Oct 2010, but still am able to get ARCs fairly easily. Are there any publishers that ship books to the UK? or outside of US/CAN? Thanks so much fo this post, Katie! It has so many great tips and I bookmarked it for later because, although I’ve been blogging for almost a year, I still don’t feel comfortable requesting ARCs. But when I start, your advice will make me much more confident. Great post-I’ve never actually emailed a publisher for a book, relying mostly on Netgalley and giveaways for early copies so it is definitely possible to book blog without doing so. Thanks for sharing this – I’m new to the Blog world and I have gotten used to Netgalley and Edelweiss – but I had no real idea how to get actual ARC copies for books – and these tips are amazing! I had one question – do you have the email for Atria books? Thanks again – really enjoyed this!! These are some great tips and I have often wondered how to get review copies through bigger publishing companies etc. I would like to note, though, that some authors will send you a review copy without any hints or etc. after you’ve commented on their blog and they’ve found out you had a review blog. This has only happened once or twice with smaller author but it does happy. Thanks so much for this post! Thanks for this post, Katie. Helped a lot! WOW good Info,ver helpful!^^but i was wondering,do we post the review before the books release date or after the books been released? Thanks for posting this. I’m just starting to get ARC’s for my blog (running just shy of a year) and this information is most valuable. I love posts like these! Thanks for the help! Great post and lovely blog! My blog will be a year old in April 2014 and you are right about giving a new blog some time to get settled. I get ARCs from Edelweiss and NetGalley and have enjoyed it so much. I’d love to get paper copy ARCs as well (like I need more on my bookshelf) but I do miss the paper copies. I’ll wait a bit more before contacting the publishers. Thanks again! It’s like there’s a secret code to Arc-requesting! Lots of politics involved, but it does make sense. You’re right that it’s better to be too professional than too casual. The Newbie’s Guide to Book Blogging Part 5 – How to get ARCs? Thanks for your insights. Simple, clear and informative! Thank you for posting this. I’ve been reviewing for years, but my followers are small. Do you have any suggestions on how to increase traffic and followers? Thank you very much! This helped alot! Great post, and information! Thanks! I have a question from the other side of the fence. Do you often get self-published authors approaching you about reviewing their ARC’s and what is your stance on this? Your post was just what I needed. I’m still fairly new to book reviewing so I wasn’t sure what was an appropriate timeline to start asking publishers but you’ve laid it all out for me. Thank you! !